A Snowy Labor Day on Gray’s Peak. We arrived at the trailhead around 4AM to avoid the Labor Day crowds, and there were only maybe 5-6 other cars that showed up this early. It was COLD (like 30 degrees and windy cold) and began to snow several times while climbing to the summit. 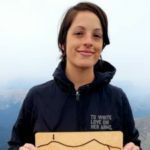 After summiting Mt Sherman (and not having the best time doing so), I was fairly concerned about how my body would react going any higher up. However overall the hike up to Gray's was easier and more enjoyable than Sherman, and although I struggled in many places we were able to get to the top without any real meltdowns! Well done, Rebekah! Glad you’re body handled the elevation better this time around.